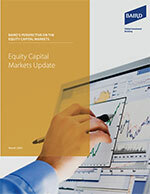 Baird’s Equity Capital Markets team produces a monthly report providing an overview of recent U.S. equity offering activity and summarizing relevant economic commentary impacting the overall equity capital raising environment. 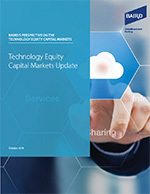 Baird's Technology Equity Capital Markets Update provides a recap of recent trends in US technology equity offering activity, as well as a summary of the relevant economic conditions that shape the overall equity capital raising environment. 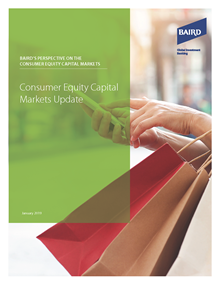 Baird’s Consumer Equity Capital Markets Update provides a recap of U.S. equity offering activity and trends in the Consumer sector, as well as a summary of relevant economic commentary that impacts and influences the overall equity capital raising environment.